Louis (age 13) has properly adopted my Cannondale and it was clear a few weeks back that I needed to get some better tyres for the winter – the Cannondale had the summer Vittoria Rubino Pros fitted and I’ve never been a fan of those once the weather turns cold and damp, and the roads start to get greasy. As Louis is still getting to grips with handling a road bike, it’s clearly more important to give him some good tyres, rather than risk a crash on a speedy descent. Saying that his mountain bike skills are proving invaluable, having witnessed him use the back brake too hard on a descent and put the bike sideways across the road, before recovering it with a big grin on his face… so lucky! I had looked at putting Vittoria Paves (the green Paris-Roubaix tyres) on my Bianchi and fitting my Gatorskins to the Cannondale. But the Paves are very pricey so, as Louis is well under my weight (so shouldn’t be at the same risk of pinch flats and impact punctures) and probably won’t be covering the same amount of miles, I’ve opted to look for grip over longevity. 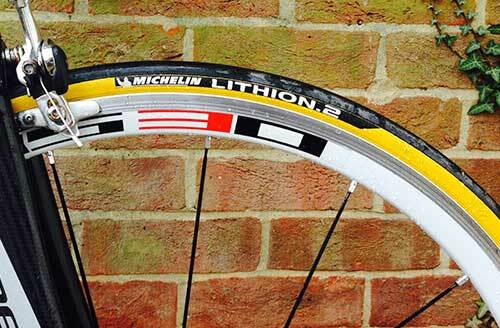 That opened up a number of choices, but we settled on the Michelin Lithion 2 Folding Clincher Road Tyre. These are currently priced at just £14 (down from £22) at Merlin Cycles. First impressions are of a very ‘tacky’ tyre, so the grip should be good. After a 50km ride last Saturday, the tyres still have that tacky feel and Louis felt confident, so they look like a good choice. I need to get a spin on the Cannondale myself soon to give some proper feedback – I’m sure there’ll be a suitably horrible day soon when I need some fresh air, but would rather not take the Sempre.